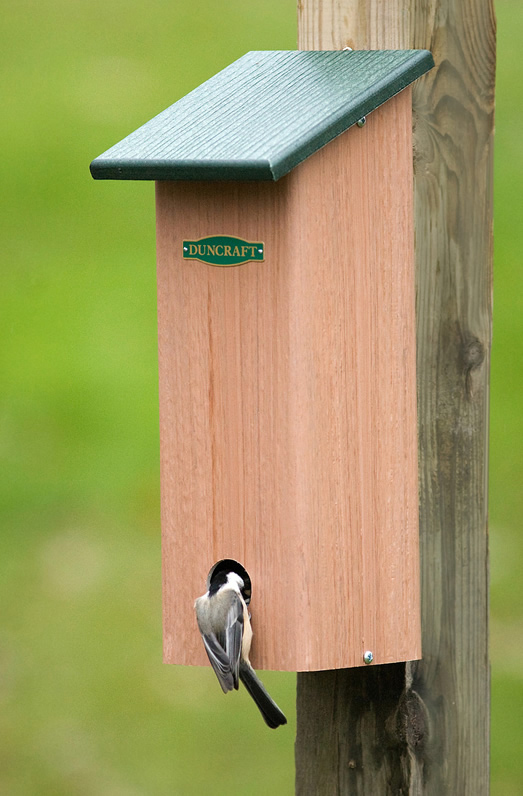 Nest boxes and roost boxes are important components of a well-maintained bird-friendly backyard. In winter, birds really need shelter from cold, winds and predators. Leaving nest boxes up may help, but during really cold times, birds can best maintain their body heat through huddling, and this is where roost boxes come in. You can expect a variety of small birds like nuthatches, titmice , downy woodpeckers and tiny wrens to find refuge during the coldest nights and windiest days in the shelter of your roost box. Roost boxes may resemble nest boxes, but they are quite a bit different. A good roost box has room for maybe a dozen small birds to huddle tightly together on several perches inside, so it needs to be larger than a nestbox and made with thicker wood for better insulation. The box typically has the entry hole at the bottom to conserve heat and make entry easier, and depending on the shape will have a couple or more perches and a rough inside (mesh is good idea on the interior walls) for birds to be able to climb around to find a spot to roost inside. You will also want to have a metal baffle on the entry to deter predators, and like most nest boxes, hinges help to make access for cleaning easy. Taped seams and adding a cozy layer of wood chips can help tremendously with insulation. You can purchase a roost box or make one yourself if you are handy. Its never too late in the season to put up a roost box. And with more winter in our future, if you don’t already have a roost box in your backyard, now might be a good time to get one up. The birds in your backyard will give you a warm thanks!